First off let me thank everyone who has supported the development and content I have provided on 6thGoal. It’s great to be part of a great community of like minded fantasy football managers who enjoy the beautiful game. While we don’t all share the same opinions, it’s great to provide content, sometimes from a different viewpoint. Have a great holiday season and Merry Christmas! Instead of preparing for Gameweek 18 I have spent more time attempting to plan out transfers leading up to the first DGW taking place in Gameweek 22. Taking injuries and potential transfers into consideration, along with fixtures for this week, I believe I will roll my FT to Gameweek 19 and make multiple changes. As it stands now, the only player still flagged heading into the weekend action is Stephen Ward, with Burnley’s run of poor fixtures, he will be transferred out soon. As I continually look over the options for my Gameweek 17 starting XI, I am left with an empty feeling, knowing my squad has some glaring deficiencies. The injury and subsequent “rest” for Alvaro Morata was unexpected, as I had him pegged as a full time starter in my 4-5-1. Rarely did I plan on playing Callum Wilson or Jamie Vardy up front in his formation. Vardy continues to struggle and his exit ticket had already been punched for Gameweek 18. However, with injuries I might have to make a unplanned transfer. The midweek, Gameweek 14 fixtures were challenging, but things don’t appear to be any easier as we head into Gameweek 15 this weekend. The holiday festivities are in full swing and FPL managers must stay sharp to and be open to potential rotation. Midweek many fantasy managers lost out on players like Hazard, Coutinho, Azpilicueta and Salah, who actually came on and in 23 minutes posted a brace. Amazing! The Egyptian continues to perform like Aladdin with his magic lamp! …and so it begins, the start of the holiday period and more games than you can shake a stick at. As games come fast and furious, it’s important fantasy managers stay ahead of the curve and dialed in to their squads. Deadline dates, while always important become imperative, miss setting your lineup could cost you. It’s also a time for rotation by managers, which means your bench players could be called upon at a moment’s notice. With a Friday fixture in the fold, fantasy managers must make their decisions a day early. Having spent the better part of my work week finalizing my holiday strategy I have decided I will roll my FT over to Gameweek 14, in anticipation of introducing Chelsea assets to my squad. After rolling last week’s FT, which I burned in a knee jerk reaction to Callum Wilson’s hat trick, I didn’t feel change was necessary after posting 84 points, a season-high, last weekend. With the international break now behind us, we put the pedal to the metal and go headlong into the very busy FPL holiday period. We kick things off this week with a big slate of games on Saturday, beginning with the the North London derby, Arsenal v. Spurs. This fixture could set the table of things to come for the week, which could potentially results in BIG scores across the board. Many favorable match ups for the big clubs, while some of the lower, in form clubs could post good returns. …and the hits keep coming, sadly the first kickoff hasn’t even happened. Woke up to the glorious news of Harry Kane being sidelined for the Man United fixtures with a twinge in his hamstring. SHOULD be just a single week, but these muscles can be tricky, as the “year of the hamstring” continues. In my last article for FantasyFootballGeek, I preach “patience,” a quality I feel I have employed since Gameweek 1. Approaching GW9, I have attempted to look ahead and plan future moves in order to take advantage of a lucrative schedules for players I’ve had my eye on. 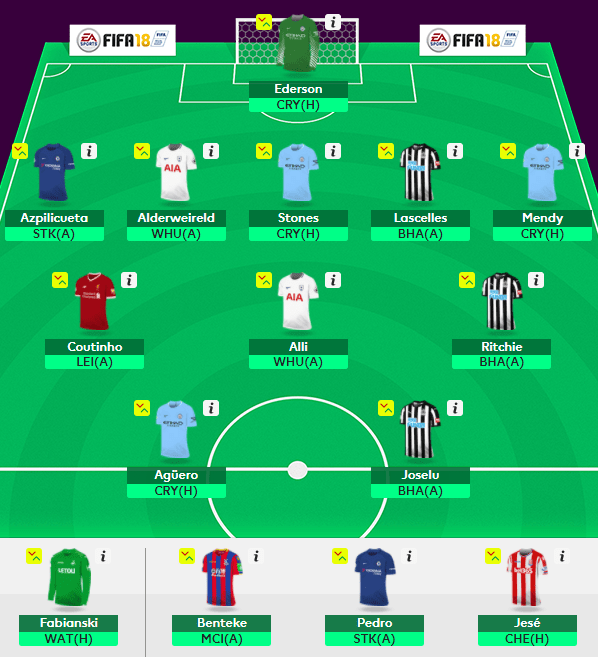 With kick off just a few hours away, I have not come up with any solution for my current squad. There are some good match ups this week; Chelsea home to Watford, Man United away to Huddersfield and Man City hosting Burnley. Spurs hosting Liverpool has question marks all over it and running with Davies, Eriksen and Kane was a bit concerning, as their home form hasn’t been up to snuff. For the week, I have decided to activate my Free Hit Chip to bring in, what I feel are a solid group of fantasy options that should hopefully provide a strong return for the gameweek. While activating chips early, in the past, have been a cause for concern, this is a new chip and we have yet to see how or when it is best to use this chip. I’ve been it used with a positive return in the past few weeks. I thought there were some good match ups, so the chip is on the table and here is what I did with it. Since this week is about “going bigger” up top, let’s look at the changes to the 3-man forward line. I retained the services of Jesus against Burnley, even with some questions mark surrounding the return of Aguero, I figure Jesus will feature for at least 60 minutes. We have seen what we can do in that time frame. Kane has been nothing but frustrating this year at Wembley, while I still back up, I decided to move him in favor of Morata, who’s home fixture against Watford looks promising. Finally “Big Rom” makes his debut on my squad against a downtrodden Huddersfield. With Kane temporarily out of my starting XI, the decision was made to keep Eriksen as my premium midfielder, he’s provided more consistent returns for Spurs, both home and away. 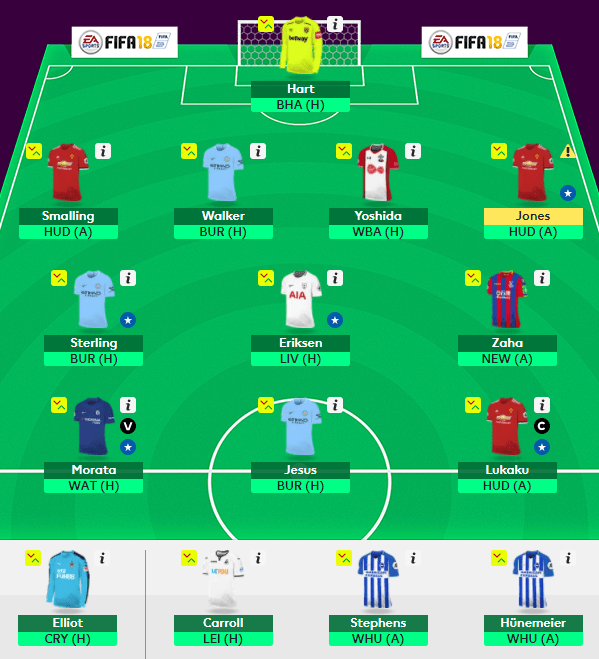 I went with a FPL community favorite this week in Raheem Sterling, who’s inclusion is a bit concerning for me, as I have never been a big fan for club or country. You can’t deny the success he has had this season, so I push my allegiance aside and give him a start. Finally, Crystal Palace’s Wilfried Zaha will make up my 3-man midfield. Playing OOP as a forward, proved a viable differential last week in their 3-2 victory over Chelsea. We should see him retain that advanced role away to Newcastle. Defensively, I have doubled up on Man United with Jones and Smalling, as you can’t deny the bus that Mourinho has parked at the back of the United defense. Planning on a CS from the Red Devils this weekend. Walker was the only current defender who made the Free Hit cut and gives me an attacking defensive option, after last weekend’s assist was nullified by an own goal. The 4-man defense is rounded out with Maya Yoshida against WBA, who continues to struggle to find the back of the net. While this activation of my first chip doesn’t fall in line with my “patience” line of thinking, I feel it’s the right time to play it. My squad has some short term issues that need to be addressed and I wasn’t happy with the options I was presented. At best, it would have been to hold the FT for GW10 and make two changes next week. We will see just what GW9 has in store for us. My draft squad saw further change this week as I brought in three new players to help bolster my attack. Thankfully I should have Aguero back this week, who is looking to become the all-time Man City scorer and Pep wants that to happen at home. Could this be the weekend? 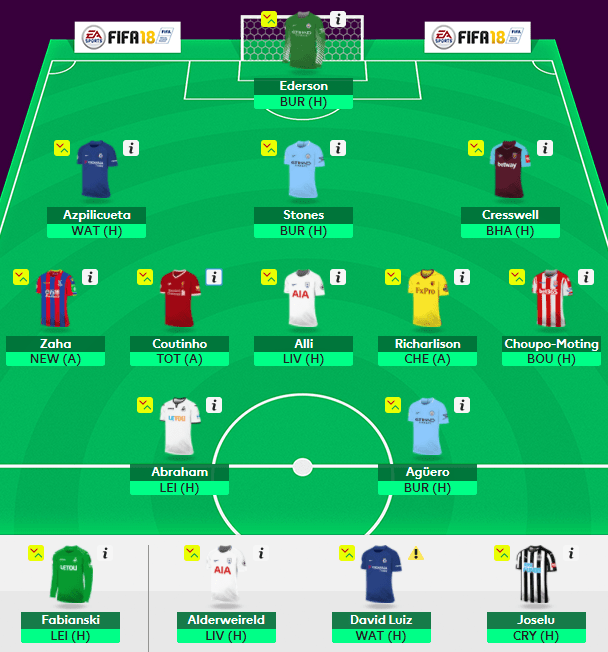 For GW9 I brought in Zaha, Chuopo-Moting and Abraham to my squad, all of whom will gain their first start for my fantasy team. This will also be the first time I start a 3-5-2 formation, dropping Alderweireld and Luiz to the bench. Starting defensive for GW9 will include Cresswell home to Brighton, Stones gets the nod home to Burnley, while Azpilicueta will face Watford at home. All three of these starters have great potential to record a clean sheet. On paper, the midfield looks solid; Alli, Coutinho, Zaha, Richarlison and Choupo-Moting. Unfortunately Alli has been lackluster to date, while Coutinho is still getting his shooting boots and form back. Richarlison and Choupo-Moting are both the “hot” budget type midfielders that fantasy owners have been yearning for. While Watford’s match up doesn’t bode well against Chelsea, I like him for the long term. Finally, Zaha, playing OOP as a forward against newcastle. He looked great in his first game back against Chelsea, so it’s my hope his form continues. We will see just what transpires this weekend, as kickoff is quickly approaching. It’s Friday morning in the U.S. and as of now, my fantasy lineup continues unchanged, as I have not used my FT for the upcoming game week. This after 534k managers have opted to bring Kun Aguero in bless him with the captain’s armband after a hat trick against Watford last week. Honestly, it’s been a fleeting thought to follow the herd, but I am against turning on Kane. Sure, he has returned in only 1 of the first 5 game weeks, but the underlying numbers are just to strong. So for now, I will continue to keep him in my starting XI and most likely give him the armband…again! Continuing up front, with Kane a mainstay in my attack, the forward line is unchanged, with Firmino and Jesus rounding out my front three. The option for the FT, which I have been considering is bringing in Jamie Vardy for Robert Firmino. Missing Sadio Mane, as meant that Firmino was playing out wide and at times deeper to help create. Liverpool face Leicester this weekend and Vardy was a “super sub” for me last in, when Lukaku was failing to score on the road. This week it could be Super Jamie to the rescue again, as he has posted some good numbers against Liverpool the past few seasons. Since 2016, in three games against ‘Pool Vardy has netted 5 times! Indications are strong he could continue this trend, as 4 of 5 goals were home fixtures. If his services are required, he would earn the captain’s armband without hesitation. Kane has continued to be a frustrating selection. At 10.8 % TSB, Vardy could be considered a differential to forwards that include Kane, Lukaku and Aguero. The midfielder continue to feature Christian Eriksen and Henrikh Mkhitaryan. Eriksen tasted his second no return weekend, last week, as Swansea frustrated Spurs, but he’s still the midfielder in form when compared to Alli. With Paul Pogba still sidelined due to injury, Mkhitaryan should feature as the attacking midfielder. He posted 9 points last week on 1 goal/1 assist. Against So’ton, I expect Man United to score early, then sit back and put the Saints away late, which has been a reoccurring theme this season. After last weekend’s wild card activation, I look to build on a strong #5mandefence built around Alonso, Kolasinac and Davies. Many mangers lost out on Davies last week after his 14 point haul in GW4, as he failed to play last weekend. Against West Ham, he could see returns from both ends of the pitch. Speaking of West Ham, I was glad to welcome back Aaron Cresswell to the fold, as he was mainstay in my defense in 2015/2016 and 2014/2015. Tough fixture against Spurs, so something will have to give. Finally, the only hold over not to be given the axe, Phil Jones. United should have no problem defensively against So’ton, who can’t seem to muster a goal. Between the pipes, I lost points last week after bring Lukasz Fabianski in, but no one could have predicted him to outperform Rob Elliot or Ben Foster, who I dropped. This week I turn to the Swansea stopper again, home to Watford. Unlike the traditional team, the draft team has continually undergone change since GW1, averaging 4 transactions a week! This week I look to maintain a similar strategy, running a 5-3-2 formation out, with 4 City players in the starting XI. 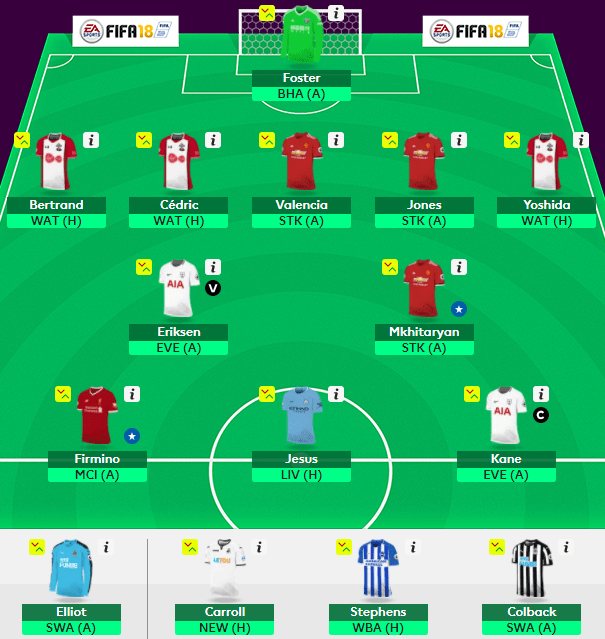 For the week I brought in Matt Ritchie and John Stones to strengthen the 15-man squad. Defensively, I could be set up for 5 clean sheets between Azpilicueta, Alderweireld, Lascelles and the City duo of Stones and Mendy. How these guys were still available was beyond me. Ederson gets the call in goal over Fabianski, which means I could be out a few bonus or save points, but City has the better chance at a CS. Starting in the midfield, Alli and Coutinho, along with new boy Ritchie. Newcastle faces Brighton and Ritchie has been a hot commodity the past few weeks, so his prospects look promising. Pedro and Jese fill the bench. Up front, I lucked out with Aguero, captializing on his big points hail last week. This week Joselu is introducded in favor of Hernandez. Much like Kane, Joslu tops that “goal imminent” table. hopefully this is the week he adds to his tally. The 15-man squad is coming together nicely, but need a big haul in order to climb the table in front of me. While I don’t want to look ahead too far, I am already planning moves for next week. It’s been an extra week off for fantasy manager as we head towards GW4 and a return of the EPL! International matches are now in the books and there were some gutty performances throughout the world. This break has provided time to reflect and strategize the coming game weeks. 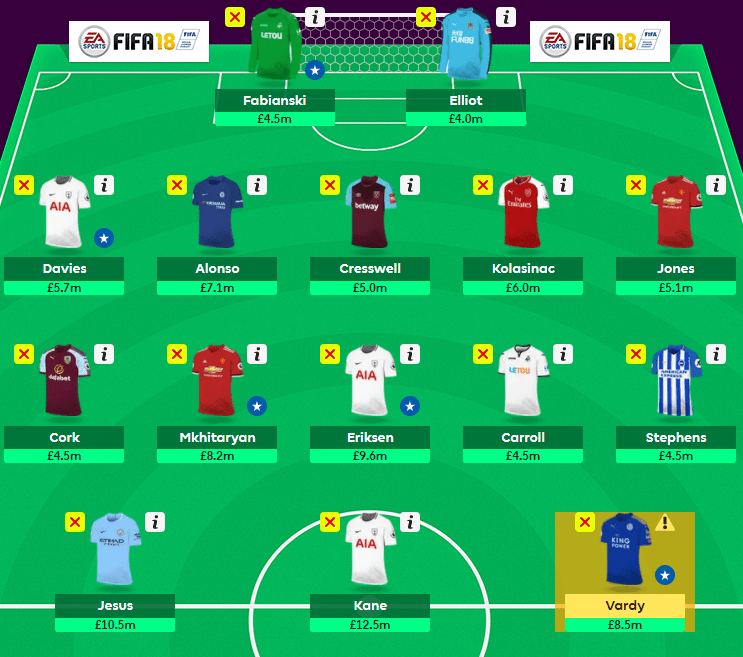 My current plan is to activate the wildcard for GW6, giving me 2 more weeks to run with a 5-2-3, potentially banking 2 FT and hoping for a £0.2, team value increase. 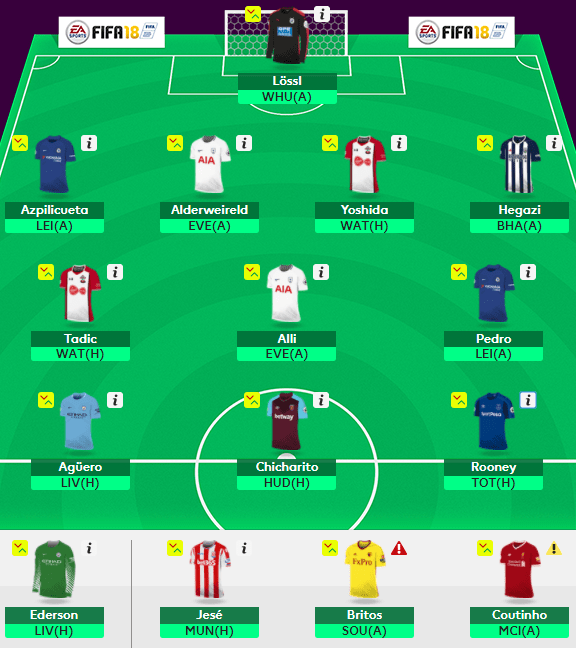 Opting not to activate my wildcard, I had one FT available for any changes to my 15-man squad. Initially I had planned on introducing Marcos Alonso, but failure to see any price increases over the break has me stuck £0.1m short of his £7.1m price tag. It’s my belief that Alonso is “essential” to fantasy squads, yet many mangers are balking at his high price. While Newcastle and Brighton seemingly have better defensive schedules than Man United, the fact United has yet to concede through 3 games, saw me bring in Phil Jones. His inclusion this week is merely temporary as we play out the next few weeks, in anticipation of my wildcard. United will face sto/EVE/sou and partner with Valencia, as I double up. It also means I maintain 3 So’ton defenders (home to Watford), in search of a third CS in the first 4 games. Foster will earn his 4th start, away to BHA. I feel confident with this group of defenders the next 2 weeks. Mhkitaryan transferred in GW2, while Eriksen was introduced for GW3. This will be the first week I have maintained the same 2-man midfield for consecutive games. Eriksen was absolutely nasty during the international break, 2 goals/3 assists over two games. This bodes well as Spurs are away to Everton and with September here, means Kane should benefit from Eriksen’s blistering form. With 10 goals on the season to start the season, Man United has been the hottest team on the pitch, thanks in part to 5 assist Henrikh Mkhitaryan. He and the Red Devils will look to continue their torrid pace away to Stoke City. Based on the Sqwaka data, Mkhitaryan bests teammate, Paul Pogba in assists (1.67/gm), key passes (3/gm) and chances created (4.67/gm). Yet, it’s Pogba who’s got the better shooting statistics. Entering GW4 I have some concern up front, while I still have faith in Firmino, Jesus and most notably Kane, the first two players are flying back late from international duty in South America. As hot as Firmino has been, I don’t see Klopp starting Sturrdge in his place. As for Pep, who the hell knows, as both Jesus and Aguero have long trips in order to represent City this weekend against Liverpool. Kane appears to have the August “Hoodoo Voodoo” behind him and will look to get on track to his third Golden Boot this weekend, away to Everton. Backed by ungodly statistics, I continue to have faith in Kane putting up big numbers. To date, it’s been a string of no returns and 2 yellow cards, but can’t deny the 22 attempts he’s had in 3 weeks. Moving to the draft game, I still spend very little time and maintain little interest in this style of fantasy game for football. Currently I head into GW4 with an unchanged 15-man squad. I have put a waiver wire claims in for Serge Aurier and Phil Jones, who would replace Miguel Britos. The squad still appears to be finding their feet as their combined performances hasn’t been overly impressive to date. Teams like West Ham and Everton will see their fixtures improve, while there could be some competition defensively for So’ton and WBA assets. I change the formation for GW4 from a 5-3-2 to a 4-3-3. Britos currently suspended is on the bench giving me a back four comprised of Azpilicueta, Alderweireld, Yoshida and Hegazi. All have favorable fixturs with So’ton and WBA carrying he best chance at clean sheets. As poor as West Ham has been, I tap Lossl to keep a CS and record some save bonus points for Huddersfield. With Stoke City home to United, I make a questionable decision to bench Jese in favor of going with 3 forwards for the game week. Jese is still trying to find his fitness, but more importantly United hasn’t conceded to date. This leaves me with Tadic, Alli (middle finger and all) and Pedro to be the creative influence in the middle of the pitch. Still considering a play for Mooy in place of Tadic, even with So’ton in a great run of fixtures, Mooy appears to be more instrumental, carrying better form into GW4. The wildcard I still have is Phillipe Coutinho. Just what will he do for Liverpool is anyone’s guess. Rumor has it he doesn’t want to feature in the ECL for the Reds as he looks ahead to possible inclusion for another team if he leaves in the January transfer window. The Liverpool midfield is already crowded, but they could benefit from his inclusion in the starting XI. He’s listed at a ‘75% chance of playing – lack of fitness’ but featured for Brazil during the break. Go figure! Currently, he’s on the bench for the 4th consecutive week. Up front, Aguero is tapped to start, going back to a 3-man front line with Hernandez and Rooney. Vokes and Okazaki present two interesting options, but fixture for both Everton and West Ham are improving, which has me holding both players. Rooney and Hernandez have both found the net twice and could feature this weekend as well. Sitting in 4th, 32 points from the leader and a red arrow from last week, I will look to turn things around before we look to make further changes in the starting lineup.